This draft is no longer current. Please see https://ncrecords.wordpress.com/2017/09/18/final-drafts-of-functional-schedules/ for the latest version. Record Types – groupings of records that are “created, received, or used in the same activity.” (From Richard Pearce-Moses, A Glossary of Archival and Records Terminology). Description – a description of the records, often including the types of records that can be frequently found in that series. 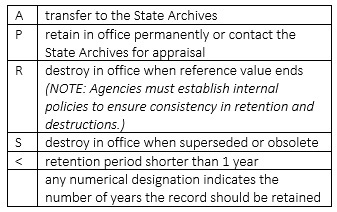 Disposition Instructions – instructions dictating the length of time a series must be retained, and how the office should dispose of those records after that time (either by destruction or transfer to the State Archives). For any records that will transfer to the State Records Center, either for temporary storage or for transfer to the State Archives, there will be an Appendix that lists the item number that is necessary to track these records. Citation – a listing of references to statutes, laws, and codes related to the records series. Citations can include Authorities (governing the creation of records), Confidentiality (limiting access to public records), and Retention (setting a retention period). Closed: With a record such as an investigation, the retention period begins once the case is closed. Complete: With a record such as a report, the retention period begins once the report has been finalized. Reference value ends: Once the content of a record is no longer useful or significant, it can be destroyed. This disposition is usually applied to records that were not created by the agency. Superseded or Obsolete: With any record that is produced in versions, an older version can be destroyed when the new version is received. Please review the current draft and Leave a Reply at the bottom of this page to share your feedback with us. This draft will be available for review for 30 days. May 6, 2017 in Functional Analysis Initiative.